I have been seeing silk scarves popping up on a lot of stylish ladies and really love the look for the warm months ahead. Knotted in a bow, tied into a ponytail, worn around the neck. I already had a few scarves that I had either stolen from my mom or bought at a vintage shop, but I wanted to up my collection for the summer ahead. This seemed like a perfect vintage hunt, since many of the new scarves were going for $30 and beyond. 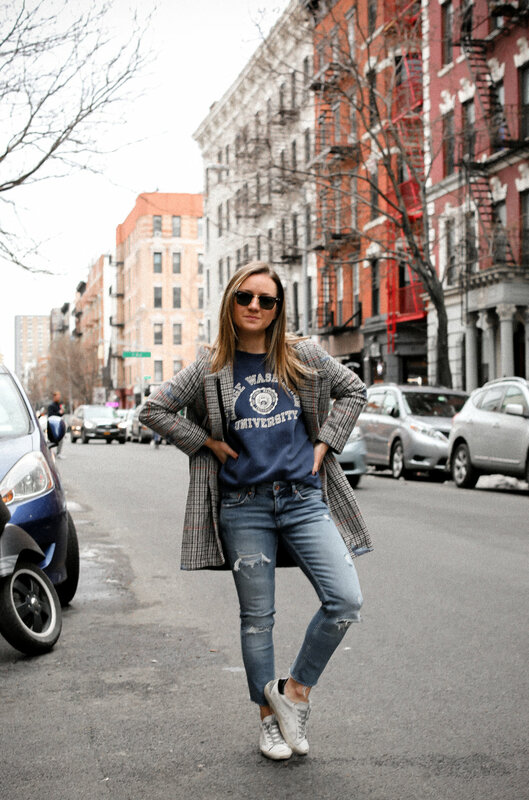 In the spirit of vintage, I wore this literal old-school sweatshirt that was actually my dad's in college when we went to the store and out for happy hour on Friday. It has completely shrank, has tears, rips and a stain or two. But needless to say, I love the classic collegiate vibe and knowing my Dad wore it back in his younger days make it that much cooler. My vintage hunt was a success - I got 4 silk scarves, all for $5 a piece! I also got a green floral dress with pleats and two bright cotton printed skirts. All I pieces I plan to re-work into new looks. I definitely plan to share photos as they are completed!